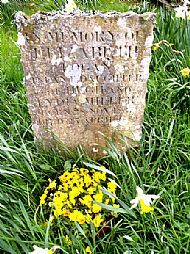 The little headstone of Hugh and Lydia Miller’s first-born child Eliza, who died of a fever aged only 17 months, is clearly visible in the middle of the grounds. (This is the last piece of stonework that Miller undertook.) Several of his ancestors lie beside her. Before their marriage, this place had been one of Hugh and Lydia’s trysting places during their long courtship. Just outside the graveyard is the tomb of Sandy Wood, whose unfortunate demise is recounted in Scenes and Legends (Chapter XIV). It is sometimes mistakenly referred to as “the pirates’ graveyard,” arising from the appearances of skulls and crossbones on many of the tombstones, although they are merely symbols of mortality. 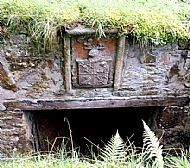 Opposite Eliza’s headstone lies the private chapel of the Urquhart clan chiefs, long since reduced to grassed-over rubble, but their crest can still be seen over the entrance to the crypt below. Miller relates many tales of the Urquharts in the above work. Altogether, this is one of the most historic sites in the parish, and remarkable for its atmosphere of peace and tranquillity and tradition. The private mansion of the laird of Cromarty, it was built by George Ross, 1772, with stone recycled from the medieval castle of the Urquhart clan chiefs which he demolished for the purpose. Miller also wrote copiously about the eccentric Urquharts. The elegant Stables nearby, restored by Cromarty Arts Trust, houses a community of local artists, who rent the old stalls. The grooms’ quarters above are now an exhibition and conference centre. Return now down the Castle Brae, and turn right on to the Reid’s Park Loop footpath. On this beautiful circular shoreline walk, you come to the well by a stream at the foot of St Regulus churchyard. This is the site of an old shaft bored in search of coal – a prospect which Miller, unheeded, warned would be a complete failure. 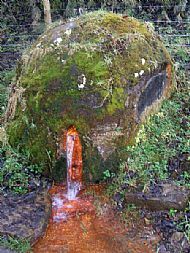 The water, full of oxide of iron which vividly colours the stream-bed, was over many decades drunk by Cromarty folk for its health-giving properties. Continuing on the shoreline walk, you will pass round the bay in which Hugh Miller made his famous discoveries of Devonian era fossil fish, of which you will have seen some specimens in Miller House. They formed the basis for his most renowned geological work, The Old Red Sandstone. Beside the woodland “100 Stairs” walk leading to the cliff-top, are the settings of his wild boyhood adventures so rivetingly recalled in some 100 pages of his autobiography, My Schools and Schoolmasters, (Chapters II to VII). They also furnished him with another rich source of legends. The spectacular panoramic views of the Moray Firth, the Fearn peninsula to the north, and the mountains of Ross to the west can be admired from a cliff-top viewpoint. You can cross the fields from the Sutor headland southward to a grove of beeches, beyond which is a stile taking you on to the steep cliffside path down to MacFarquhar’s Bed. This footpath can also be reached by a track starting at the Cromarty Mains cross-roads. You will come out in front of a spectacular natural stone arch, and beside it an open-sided grass-topped stone outcrop looking like a giant whale’s jaw. To the left are the large caves named for the mysterious MacFarquhar. It is only known that he was a smuggler, but his exploits have been lost in the mists of time. Miller made these caverns famous as a sometime haunt of gypsies, whose freewheeling lifestyle he reported on to the Inverness Courier in 1829 (A Noble Smuggler And Other Stories, ed Martin Gostwick).